University of Houston Libraries is piloting a new service based on student feedback. You may now send a text to report excessive noise at the MD Anderson Library. 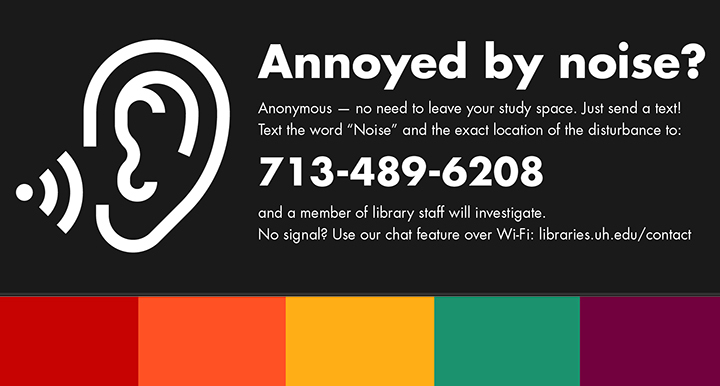 Text “Noise” to 713-489-6208 to report excessive noise within the MD Anderson Library. Text the word “Noise” and the exact location to 713-489-6208. A member of the Libraries’ staff will investigate. No signal? Use the chat feature over wifi: libraries.uh.edu/contact.